Imagine a banquet at the house of Levi the tax collector. There is singing, drinking and eating. In the midst of all this reclines Jesus and his disciples. On the periphery of the scene are the Pharisees as well as several of John’s  as well. They, too, have been following Jesus. Unlike Jesus and His apprentices, however, John’s disciples would rather not to eat with the sinners and tax collectors that constitute some of Jesus’s companions. Still, they are intrigued enough to stay close and observe. As the meal progresses, the Pharisees began to ask Jesus’s disciples questions such as, “How often do you fast?” The disciples are unable to answer with their mouths full, so they shrug and look at Jesus. Jesus responds with two parables; the Parable of the Old Coat and the Parable of the New Wine. In the first parable Jesus observes that no one patches an old garment using cloth from a new one. If he does, he will have ruined two garments; the new one from which the patch was taken and the old one whose seams will tear. The parable of the wineskins offers a similar message. No one pours new wine into old wineskins. If he does, the new wine will burst the skins . 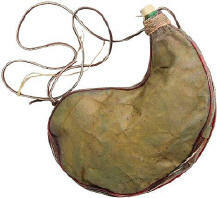 Thus, only wine not yet fermented (= new wine) can be placed into new wineskins. At the same time, after drinking well-aged wine who would ask for unfermented wine? Afterall, “the old is better” (Luke 5:39). There have been much chin-pulling over these two parables. Their meaning seems obvious, at least on the surface. The new garments and the new wine represent the Gospel of Grace (salvation by faith) and old garments and old wine represent the Gospel of the Kingdom (salvation by works). That no one tears a new garment to patch an old one is meant to suggest that Grace and Law do not mix. Similarly, just as new wine would burst the old skins and be spilled, so too would the Gospel of Grace be lost within the context of the Mosaic Law. Almost all commentators have agreed that the old wine, old wineskins and the old coat are metaphors for salvation by obedience to the Mosaic Law. On the other hand, the new wine and the new coat metaphorically represent salvation by faith alone through grace. This traditional interpretation of the double parable can be summed up in one word: incompatibility. Jesus is understood to be teaching that the Old and the New Covenants are incompatible where salvation is concerned. The Church, so these parables suggest, is to be a new and separate movement, not a patch attempting to prolong the institutions of the Old Covenant. The New Covenant is viewed as replacing the Old. This understanding would seem obvious except for two problems: First, the incompatibility argument is anachronistic. Within the last fifty or so years, critical scholarship has come to acknowledge that Jesus was not trying to start a new religion, nor was his intention to dismantle the Law of Moses. Moreover, it goes without saying (though I’ll say it) at the time that Jesus gave the double parable there was no Christianity, much less a church with which to be incompatible. Indeed, at the time the Gospel writers were recording the double parable, the Church Fathers’ model of Jesus as an antagonist of the Old Covenant and Judaism had not yet even been conceived. What has, in fact, become worn and obsolete is the very notion that the historical Jesus was opposed to the practice of Torah. There is no denying that Jesus taught doctrines that were controversial, but none of them – even the controversial ones – were out of the mainstream of Torah teaching of 1st century Pharasaic Judaism. To attribute the idea of incompatibility to Jesus, as a way of describing his relationship to Judaism, is bad theology and bad history. The incompatibility interpretation stems from a supersessionist theology of a later century. To place it into the teachings of Jesus is not supportable either in the text of Holy Scripture or the culture of His day. A more serious textual problem is the closing line of Luke 5:39, “And no one, after drinking old wine wishes for new; for he says, ‘The old is good.’“. This verse is found only in Luke’s version of the double parable, and even then the Western version of the text omits it. Evidently, the problem this created for the later scribes of Matthew and Mark (i.e., it reverses the value of the new wine), was so contradictory to their doctrine that they simply left it out. Indeed, if the Gospel is represented by the new wine, then the statement and even the entire metaphor makes no sense. It is as if Jesus was comparing Judaism to good claret and the Gospel to cheap Skid Road wine. Textual critics, such as Ehrman, attribute the omission as anti-Judaic bias in the scribal transmission. The double parable was evidently being read according to the incompatibility interpretation at a very early stage. He told them this parable: “No one tears a patch from a new garment and sews it on an old one. If he does, he will have torn the new garment, and the patch from the new will not match the old. And no one pours new wine into old wineskins. If he does, the new wine will burst the skins, the wine will run out and the wineskins will be ruined. No, new wine must be poured into new wineskins.And no one after drinking old wine wants the new, for he says, ‘The old is better. '” Elisha ben Avuyah said: “He who studies as a child, unto what can he be compared? He can be compared to ink written upon a new sheet of paper. But he who studies as an adult, unto what can he be compared? He can be compared to ink written on a previously used and much-erased sheet of paper. Rabbi Yose ben Yehudah of the city of Babylon said, “He who learns from the young, unto what can he be compared? He can be compared to one who eats unripe grapes, and drinks unfermented wine from his vat. But he who learns from the old, unto what can he be compared? He can be compared to one who eats ripe grapes, and drinks old wine. Rabbi (Meir) said: Do not pay attention to the container but pay attention to that which is in it. There is a new container full of old wine, and here is an old container which does not even contain new wine. Luke has gone to some pains to demonstrate the unsavory character of Jesus’s choice in disciples. They are fishermen, tax collectors and “sinners”. They have not been educated with the sages. Thus, the Gospel authors represent them as clean slates, a fresh, unsmudged piece of paper for Jesus to write on. This is not to suggest that the disciples had no education. A primary education in Jesus’s day involved an extensive memorization of Scripture and knowledge of Torah. However, only the very gifted went on to study beyond the age of 12 or 13 and only the truly exceptional (and perhaps wealthy) went on to become apprentices of the sages. This was the case with Jesus’s choice of disciples. There once was a celebrated metal welder who was known in northeast Minnesota for his excellent work. He often remarked that he would rather teach welding to a drunk he found in a bar who had never held a welding torch in his hand than teach a welder with previous training and experience. A man who had never been taught to weld was still teachable, but a man who already knew how to weld was not. The double parable, then, is not a polemic against Judaism; it is simply an explanation of his choice of disciples. In essence, Jesus was saying to the Pharisees, “Look, You can’t teach an old dog new tricks,” explaining why Jesus wanted new, unbiased followers for His apprentices. On that day, when two, “poorly” educated fishermen stood before the Sanhedrin, they demonstrated the full caliber of their education under Jesus and vindicated his choice of apprentices. New garments, new wineskins and new students. *AWESOME TEACHING ON THE “PARABLE OF THE WINESKINS (YOU CAN’T TEACH OLD DOGS NEW TRICKS).” I AGREE TOTALLY WITH THIS EXEGESIS. IT IS VERBATIM FROM WHERE I LEARNED IT FROM, WHICH IS FIRST FRUITS OF ZION (F.F.O.Z. ), TORAH CLUB VOL.#4 CHRONICLES OF THE MESSIAH, PARASHAH: EXODUS/SHEMOT, GOSPEL LUKE 5:12-39.